Great Lakes Gourmet Popcorn began as a cottage industry product. The gourmet popcorn with a variety of flavors has consistently received rave reviews. Now, owner and Saugatuck Michigan resident Julie Schalk is ready to take it to the next level. 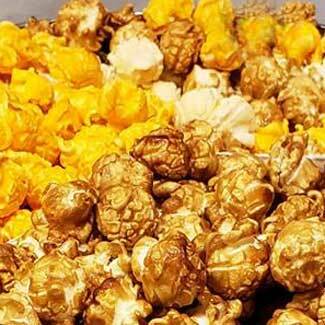 This gourmet popcorn is fresh air-popped organic mushroom kernel popcorn coated with delicious homemade caramel. Other flavors include caramel corn drizzled with different flavored chocolate such as white, dark and milk Ghirardelli chocolate. The cheese popcorn with real cheese melted and poured over the popcorn is evenly mixed to perfection. The taste is incredible! The popcorn is packaged in a resealable high barrier pouch bag with a see through window and yields 8-9 cups of popcorn.